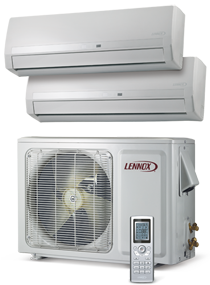 Ductless split heat pumps and air conditioners are an excellent alternative to standard ducted systems. Small, quiet and available in many different efficiencies, ductless split heat pumps and air conditioners could be a perfect fit for your home and budget. During cooler months, the MS7H works as a normal heat pump, collecting heat from the outdoor air and delivering cozy warmth to a specific room in your house. In warmer weather the process reverses, allowing the MS7H to cool the same room to a comfortable temperature. You enjoy efficient comfort in any room – and in any season. The MS7C delivers quiet, efficient cooling to a specific room in your house—perhaps a sun room that's just a little too warm, or a room addition that isn't connected to your ductwork. With its unique, ductless design, you can enjoy cool comfort without any hassles.